“Sometime in late 2017, a tiny vehicle will blast into space from India on a 10-day journey to the moon. As it finally lands on the lunar surface some 238,900 miles later, its fate will rest entirely on four small aluminium parts in its shock absorbers. They need to work in a vacuum, with lubrication that doesn’t freeze or jam no matter what the angle. And if they fail, there’s no one to go up and fix it – meaning that eight years of work and $20m (£13.2m) in prize money will be lost in space.” - Late in the year 2015, The Guardian wrote about “Google Lunar XPrize: India's moonshot at the space race” and about Team Indus, India’s only representation at the prestigious competition. Sounds cool, doesn’t it? What’s even cooler is the prize money for the winners – a whopping $20 Million for the Grand Prize! The teams must develop low-cost innovation for building and operating the rover in addition to the fact that all missions’ costs must be privately funded. After having started with 30 teams from 17 countries, currently, there are 5 teams in the race: SpaceIL (Israel), Moon Express (US), Synergy Moon (International), TeamIndus (India), and HAKUTO (Japan). Well, then let’s get to know more about the team behind this ambitious and exciting project! 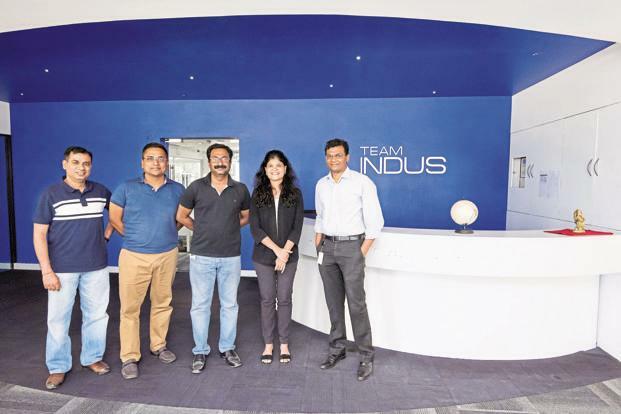 The Bangalore-based startup ‘Team Indus’ was founded by IIT-Delhi alumnus Rahul Narayan, Indranil Chakraborty, and Julius Amrit. Currently, it has over 100 staff including retired ISRO scientists and several aeronautic engineers. The company has already won a million dollars for the successful pilot test of the lunar lander technology in 2015. Team Indus’s vision is to become an all-round company to undertake interplanetary missions and develop satellites through crowdfunding and on the basis of equity and payload. The project has already found many investors with names like Ratan Tata, Nandan Nilekani, the Bansal brothers from Flipkart among others. Prototype of the TeamIndus spacecraft. It is a costly mission and thus needs precision engineering and a lot of cutting edge technology to compliment the complex procedure of making, landing and maneuvering the lunar rover. After the record-breaking 104-satellite launch by ISRO, it has agreed to launch a private lunar mission for the lunar rover of Team Indus later this year. To be carried by ISRO’s PSLV, the spacecraft is a 3-axis stabilized, all-aluminium quadropod. 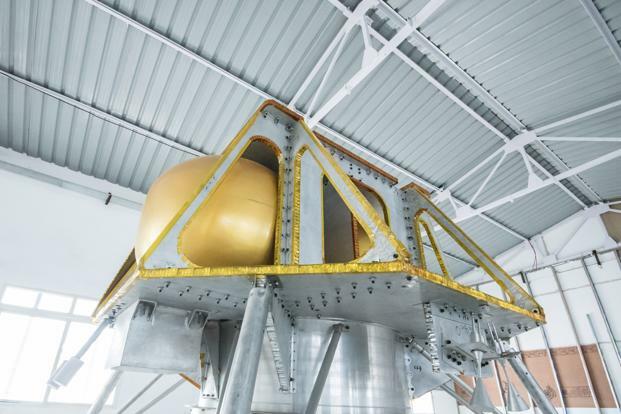 The spacecraft will weigh around 600 kgs at the time of takeoff. It houses a 460 Newton rocket engine, 16 control thrusters, fuel tank, oxidizer tank and guidance, and communication hardware. 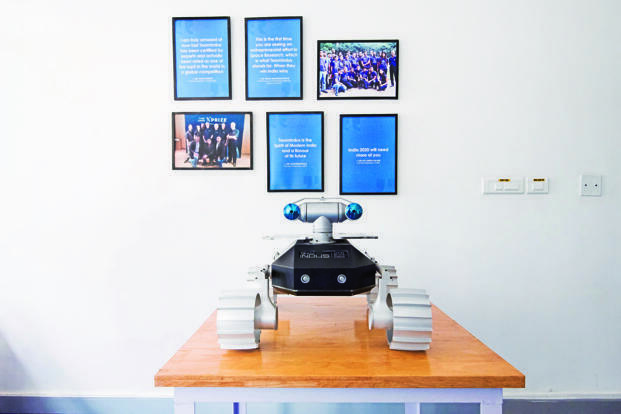 The spacecraft houses Team Indus’ rover, ECA. The company claims the spacecraft can survive temperature ranging from -230 degrees to 150 degrees Celsius. The rover, codenamed ECA, is a 5 kg, all-aluminium, four-wheel drive, all-terrain rover. It is supposedly one of the lightest rovers which will roam on the moon’s surface. Special attention has been given to the designing and manufacturing of the lightweight and tough wheels which are built to face harsh lunar conditions upon landing. The rover would have to land on the large dusty plain on the sunlit side of the moon called the ‘Mare Imbrium’ to unfurl the national flag and begin its journey. This would make Team Indus the world’s first private company to have made a soft landing on the moon. As a part of their crowdfunding initiative, they will offer Indians the opportunity to leave their names on the moon, for a price. For a mere Rs 500, Team Indus will take the names of their public donors and preserve them on the moon, by micro-engraving them on a small-sized aluminium object. This will be placed on the lunar surface when their lander descends on the moon. The entire nation (including us) is backing this project to be successful and the best of luck. There’s much ground to cover before we finally claim glory, but this mission will surely open up infinite possibilities for the close-knit communities of the students, researchers, manufacturing and technological industries ably supported by the government and other agencies. Team Indus, do us proud. May the force be with you! You can follow the links mentioned below for more information.